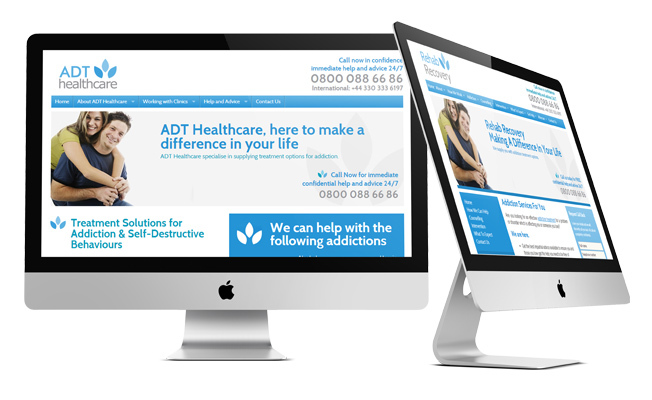 ExtraDigital have recently completed a project for ADT Healthcare, an addiction advice and referral service. ExtraDigital designed the main ADT healthcare website, this site offers information about ADT Heathcare and appeals to clinics and treatment centres that may want to sign up to ADTs referral service. The website was built on the ExtraCMS as the client wanted the website built on a platform that would allow them to easily edit and manage the site. This included updating the copy, images and add pages. The website was completely designed, developed and copy written by ExtraDigital. ADT healthcare were extremely pleased with the website and have decided to use us again with the design and development of two more websites. The second and third websites are aimed at people seeking advice and information for addiction problems, both websites will also be copy written by ExtraDigital. ADT healthcare will also be using ExtraDigital for their healthcare marketing when all websites are complete, we will help them to promote the websites through natural search and paid advertising. ExtraDigital offer a comprehensive marketing website design service for a range of businesses and sectors including web design for the healthcare industry. To learn more take a look at our range of business website designs or contact us today to get an initial, free website review and find out how we can bring your business to life online.